Another of our learners who comes to our “Never Too Old” sessions was lucky to survive from Viral Encephalitis seven years ago and has had to re-learn everything as it affected her memory and she could not remember anything. She recently sent us a letter about how coming to Bodster CIC has positively improved her whole life. In her letter she speaks of feeling really depressed when she first came on the course with low self-esteem trying to cope with her own issues alongside having a mother and brother who were also not well. 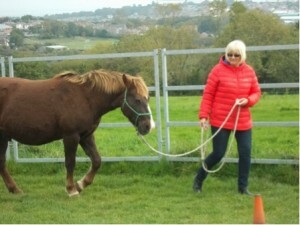 This learner has continued to come to sessions with us and she is always cheerful despite all this and is always enthusiastic and keen to find out about the ponies and how to be with them. She has told us on numerous occasions how when she is feeling low she thinks of the ponies and it brings an instant smile to her face. This learner has in fact said that being around the ponies has helped her relearn old skills and learn new ones and just watching them has been a sheer delight to her. When she was younger used to help train young stock and so rode and knew a lot about horses. She lost all this knowledge when she had Viral Encephalitis. She has shown real dedication relearning skills and has enjoyed learning more about Natural Horsemanship. Despite her difficulties and illness this learner is always cheerful, always chats to the other learners in the group and encourages them to join in and always asks after the ponies and us. She has used strategies such as pictorial aids to help her remember things and is always keen to ask for help to develop her skills. She recently decided to try some extra one to one sessions with us and has so developed her skills further. Although interested in riding she is keen to continue with us at Bodster in particular to learn how to develop relationships with the ponies of our herd. This learner is a pleasure to work with and so open to learning.